Scott Gerhardt Drawing cards is usually important - but not here. Simple firing off a random cantrip at the cost of 1,000 LP gained to your opponent is terrible. In any offensively minded deck, this card is horrible. If you're playing Exodia.dec, though, then I would highly recommend this card. The ability to reduce your deck from 40 cards to 37 is a major advantage, and when your opponent's life does not matter, then it doesn't matter what you give them as long as you draw cards. In general, though, the card is bad and should not see play. Introduction: Yeah! I get to draw an extra card! *Opponent gains 1000 Life Points. Conclusion: This might not really give you such a good upstart. and lets the opponent gain 1000LP. of your deck. The opponent has gained 1000LP. your deck and the opponent has not gained 1000LP. said 2 cards, it would be so much better. that contain EXACTLY 40 cards with the goblins in. Upstart Goblin allows you to draw a card at the cost of your opponent gaining 1000 Life Points. The only reason why it's restricted to one in Japan is because there is a card that states, whenever your opponent gains Life Points, he loses it instead. Even still I don't think it should of been restricted to one. With our current pool of cards here in the States, this card is pretty useless. The only use it gives you is that it thins your deck by one. Unlike Pot of Greed, you don't gain any card advantage from it. 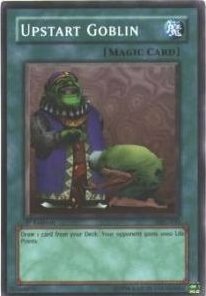 If you had 5 cards when you played this card from your hand, you would still have 5 cards in your hand after it resolved (And your opponent would be up 1000 Life Points). Right now, the only deck I would play this in would be an Exodia based deck. There's not much else that gains any benefit from it. Today is Monday, and we start a new week with a very unusual card, Upstart Goblin. Believe it or not, this card is restricted to 1 in Japan. The Japanese found it necessary to restrict almost every drawing card (Masked Sorcerer and the upcoming Share the Wealth and Vase of Greed have escaped the restriction list, for now...). This should tell you how powerful drawing is in this game. Due to the small deck size, and the fact that almost any card is a game-altering card, any way that you can get a card drawing advantage will put you one step ahead of your opponent, and this card is no exception. Exodia decks, play 3 of these while you still have them. Since Exodia decks focus on the automatic victory, your opponent's life point cost will not matter (unless Exodia falls through, in which case, you lose =P). This card actually combos well with Megamorph. If you have less than 1000 LP more than your opponent, use Upstart Goblin, then they'll have more LP than you. You can guess what to do now. Equip Megamorph on your hardest hitter, and pound your opponent into the ground. There will also be future cards that will combo with this, but we will cross that bridge when we get to it. Honestly, I have not seen anyone play this card nor hear of anyone doing so. Unless you are completely desperate for drawing advantage, I would avoid this. Unless you are playing an Exodia deck in unofficial duels in this prerestriction era (3 of them, of course), or want to try the Megamorph combo, I would avoid it. Upstart Goblin gets a 2.5. To be perfectly honest, this may be the lowest score I'll ever give a restricted (or soon to be restricted) card. It can do stuff, but that's about it.